Monday: 1 to 9 p.m.
Tuesday: 1 to 9 p.m.
Thursday: 1 to 9 p.m.
Sunday: noon to 4:30 p.m. The idea of a library was born. A library for Rosemère’s English-speaking adults was established on a private property. A library for English and French-speaking youths was set up. We have been told that Rosemère was not only the first bilingual library in the region, but in the Greater Montreal area. A library for French-speaking adults was established. The Municipal Council adopted a by-law merging the three libraries. The new library served four clienteles: French-speaking adults, English-speaking adults, French-speaking youths and English-speaking youths. By then, the library boasted almost 5,000 books. 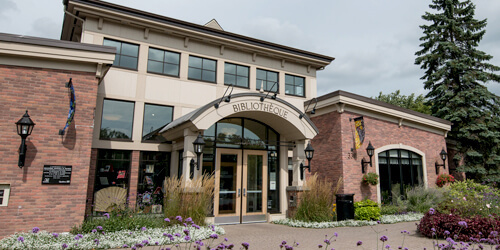 The library moved to the Rosemère Community Centre at 339 Grande-Côte. The library hired permanent personnel. The library was expanded and transformed. With the introduction of the Internet, the library made new information technology available. The library was expanded, between September 2003 and April 2004. On April 13, the new library opened. Floor space had increased from 425 m2 to 1,462 m2. The online catalogue was launched. The mobile library was introduced. E-book loans and access to online resources became available.